Lightbox Feature: Katie Marks of Silver Lining Ceramics | CREATIVE RETAIL PACKAGING, INC. Imagine your favorite coffee mug in the morning, or the go-to wine glass you reach for after a long day of work. Now imagine sipping your favorite brew, cold glass of white, or perfect red from a piece of art – hand sculpted and painted by a woman with red hair as fiery as her passion for her craft. Katie Marks is a self-taught (or should we say YouTube taught?) local ceramic artist from Seattle. From a ceramic wheel she hunted down on Craigslist, Katie taught herself how to “throw” - a process in which the pottery wheel rotates via foot power and motor as a solid ball of clay is pressed, squeeze and pulled gently upwards and outwards into a desired shape. 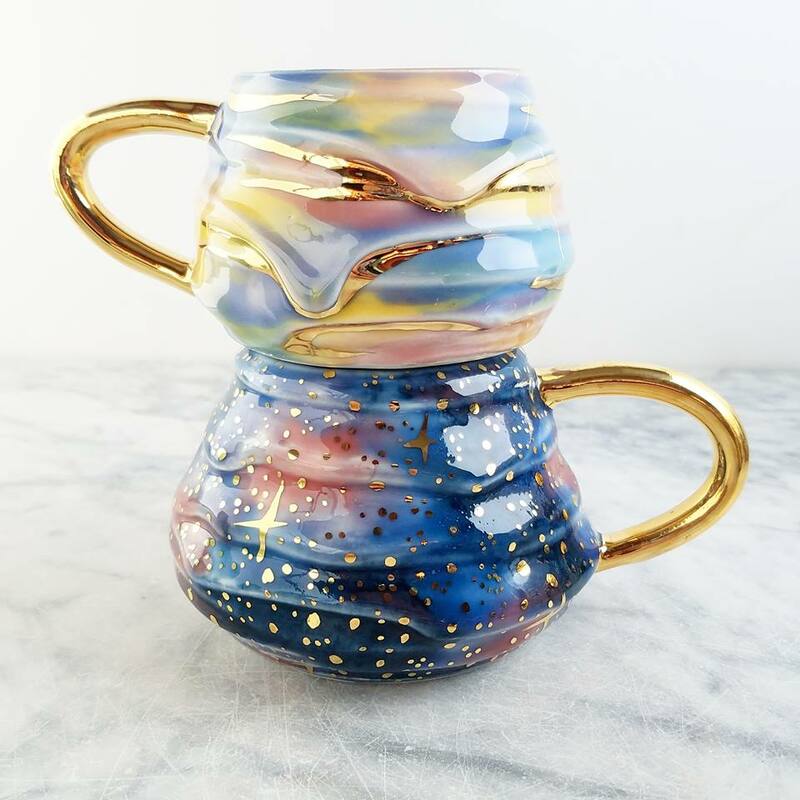 In Katie’s case, the desired shape comes in the form of functional porcelain coffee mugs, wine glasses and more which she then masterfully sculpts and decorates to create her whimsical and intricate Magic Mugs, Geode Wine Cups, and Galaxy Mugs. Katie takes something as familiar as a coffee mug or wine glass and transforms them with sculpted crystals, 22k gold accents, and glazes made from raw materials. Drawing inspiration from the natural world and her geology and astrology backgrounds, Katie says she “loves the play between taking something that the earth does so beautifully and adding my human element to it.” She applies the textures and colors of the world to her work and because her hands are her main tools, no two pieces in a collection are exactly the same. "As a someone who grew up in Seattle I have lived in the gloom of the overcast sky and week-long rain showers for most of my life. I wanted to show the beauty I see in the gloom." We admire her creative business model and the ways in which she leverages various platforms to show case and sell her work. She has 156k Instagram followers and has made 2,222 Etsy sales (and counting). When she finishes a collection, she often pairs a photo with information announcing her studio or Etsy sale dates. Her next Etsy sale is Thursday, October 12th at 3PM PST. We believe there is no single path to creativity and we are inspired by the way Katie has forged her own unique path. We hope her work and success story inspires others to use their creative passion to transform the world around them. *Featured images and detail shots of work by Katie Marks. To view more of her work, visit her Instagram page (@anotherseattleartist), Facebook Page (Silver Lining Ceramics), or Etsy Page.